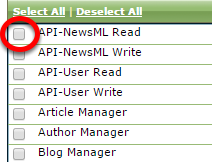 ePublishing Knowledge BaseePublishing Knowledge BaseePublishing Knowledge Base User Manager: Creating Admin Roles & PrivilegesHow do I add or modify a role? Roles are designed to limit access to only the tools your users - editors, writers, management, marketers and so on - need to do their jobs. Simply assign a new user a role, which is associated with privileges. Privileges provide access to specific tools within your website's back-end. 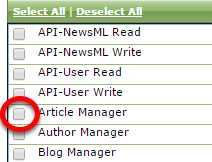 For example, two of the tools an editor needs access to are Article Manager and the Blog Post Manager. He would need to be assigned a role that allows access to those tools. A user will only see a greyed-out link on the dashboard after logging in if he does not have access to a particular tool. Reminder: Any change to a role will impact all admin users assigned to that role. They may have to log out and log back in to see any changes. If you have questions about Roles & Privileges, please contact your Solutions Manager. We are happy to help you set up Roles. 1. Open the Role & Privilege Manager by clicking Create a Role next to Role & Privilege under SysAdmin on your dashboard. 2. To add a new privilege to a role, click the box next to the privilege. 2.1. To remove a privilege, click the checked box at the top of the list. 2.2. WARNING: When you add or remove a privilege from a role, that change will affect ALL users associated with that role. 3.1. If the role successfully saved, a yellow box will appear at the top. Zoom: If the role successfully saved, a yellow box will appear at the top. 4. 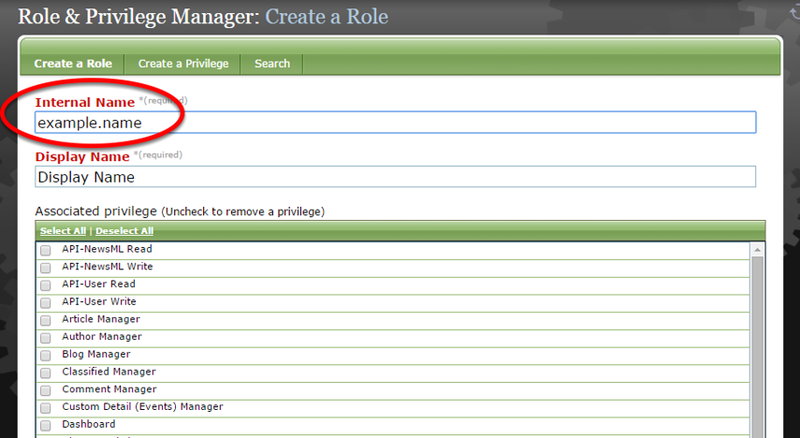 To modify an already existing role, click List in the menu at the top of the Role & Privilege Manager. 4.1. Scroll down in the window that appears to the Roles. Select the role you'd like to edit. Zoom: Scroll down in the window that appears to the Roles. Select the role you'd like to edit. 4.2. To add a new privilege, click the box next to the privilege. 4.3. To remove a privilege, click the checked box at the top of the list. 4.4. WARNING: When you add or remove a privilege from a Role, that change will affect ALL users associated with that Role. 4.5. Click Save if you make any changes to a Role. 5. To remove a role, click Delete. To reset a role to the last-saved version, click Reset. Prev: How do I create a new Admin user? Next: How do I remove a user from having access to the admin tools?